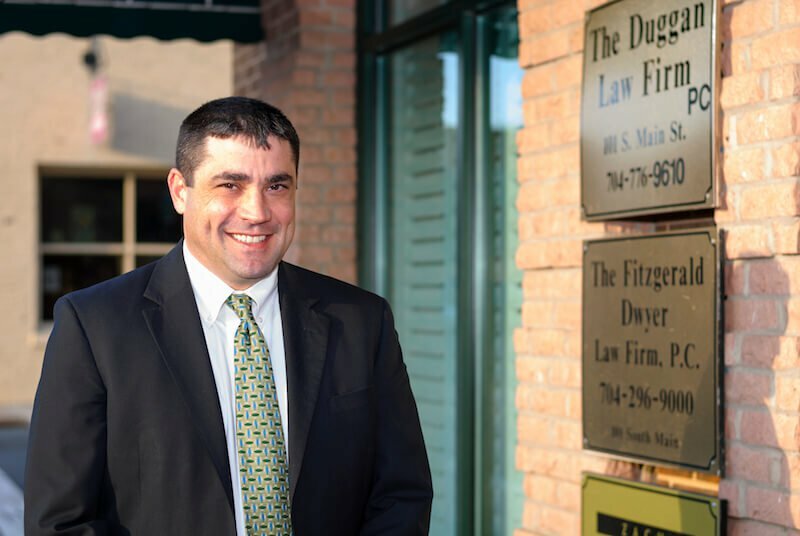 Environmental and Litigation Attorney in NC | The Duggan Law Firm, P.C. HONEST WITH THE DETAILS OF YOUR CASE. I'll explain things to you carefully and will present you with all of your options, so that you are able to make fully informed decisions. While the final decision as to a particular course of action is yours to make, I'll be honest with you if there is an issue with the course that you are proposing. WORKING OUTSIDE OF THE BOX TO GET RESULTS YOU NEED. I handle the matters that others cannot. Experienced with numerous areas of civil practice as well as my environmental background, I am able to provide options which are outside the box. I understand the complexities of civil litigation and environmental law, on both the state and federal levels. Christopher Duggan graduated from Vermont Law School in 2000 with a juris doctorate, as well as a masters of studies in environmental law. Chris is passionate about delivering results for his clients. He is proudly pro-business and pro-environment and believes the two can and should thrive simultaneously. While Chris often finds the best results for his clients are available through negotiation and mediation, he has a vast litigation experience to call on when necessary. As part of his environmental practice, Chris assists clients with environmental conditions that exist on their property, or upon property which they intend to purchase. Chris also assists clients with land use issues, zoning issues, zoning applications and land use questions, as well as, any other matter that involves dealing with various planning and zoning departments within municipalities and surrounding counties. A good portion of Chris’ practice involves general civil litigation and a robust practice which provides services to his clients including business litigation, business formation, contracts, construction defects to any civil litigation matter which confronts the client. Chris’ experience with litigation allows him to provide a wide range of services to his clients which may implicate areas of law not contemplated by his clients. Such areas may include State and Federal Constitutional claims. Environmental law is diverse, complex and is governed at both state and federal levels. When environmental legal matters arise know how to handle them and the way they should be conducted. Educating you and helping you determine the best plan of action. You have to manage the risks of litigation and know how to best approach these situations. There are many laws governing the conduct of business and these vary from state to state with startups, business structures, negotiation, contract formation, etc. Insurance law changes quickly and varies from one jurisdiction to the next. Consistently work to stay on top of the latest laws and regulations about insurance disputes. Land use and planning touches all aspects of a client’s property and/or potential development. It is important to know the proper process and procedure when requesting land use changes or planning for future development. THERE IS A BETTER WAY. LET’S WORK TO CLEAN UP WHAT WE HAVE TOGETHER. I firmly believe that environmental protection and sound business practices are mutually compatible. If the matter involves an environmental issue, let’s work together to clean it up in a commercially viable manner. I have decontaminated properties throughout the country which nobody wants to touch. If the matter involves a general litigation issue, let’s assess the problem so that we can deal with it and move forward. There must be a better way to facilitate this business and I find the way to do it. With both a Juris Doctorate and a Masters of Studies in Environmental Law, I have spent many years resolving both large and small environmental legal disputes, as well as general civil litigation cases, and has done so in both state and federal courts. This may be a new and daunting experience for you, but I have been through it many times before. Environmental law is complex, but I can explain the relevant laws to you and can help you evaluate your options. I'm passionate about environmental law and happy to provide a case consultation. Litigation is one option, but it is not the only option. I will discuss your expectations at the outset. I'll be your best advocate and will do everything within the scope of the law to obtain the results you desire. While less experienced lawyers may present you with one or two options and push you in that direction, you may miss the opportunity to take a creative but more appropriate approach. I'll ensure that you reap the full benefit of your environmental law experience. I won't sugar coat it. I won't make promises which I cannot keep. But I make sure you understand all of your options and the risks associated with each one. The final decision is yours to make, but it is my duty to make sure you are fully informed and have intelligent reasons to come to your decision. I'll provide advice as well as sound judgment, which is based on our vast experience in environmental law. I'll explore all of your options together and in many cases you may find that negotiation or mediation is more likely to yield the results you require, at a reduced cost. If litigation is necessary, then I'll prepare you diligently and ensure that I remain focused on your desired results. When I fight for you I will do so with expertise and aggression. My experience is broad and I'm committed to creating positive results for all of our clients. Sometimes this goes beyond legal services. I'll identify if and when you might benefit from the services of other professionals and will provide referrals or will work in conjunction with those professionals as required. The law does not just raise problems which I need to anticipate and combat. In many cases the law also provides opportunities. If you are considering legal action or a new business, I'll advise you about how to take advantage of and benefit from certain legal provisions. GIVING YOU USEFUL ADVICE THAT MATTERS. Business will go on. The challenge is in working out how to how to deal with the by-products in a sustainable way. For example, there are contaminated properties throughout the country that most people do not want to touch. But for investors who are willing to do some cleaning up, opportunities are hidden within many of these properties. I come in and assess the property, understand the work that needs to be done, how much it will cost and figure out how to clean it up to be a usable environment again. Working to clean up concrete property instead of taking way green property. Let’s work together to sort out what matters for your business and the environment. Honest and open communication is the key to a positive attorney/client relationship. I'll listen to you and will seek to understand your goals and concerns in relation to your business or environmental concerns. No matter the situation, there is a way together we can find to come to a resolution. I'll keep you informed about the status of your case and will promptly update you after important events. I'll strive to be available for you when you need me. Even when I'm involved in something which I cannot drop, I'll work to promptly return telephone calls or to provide access to other legal staff. It is important to my that clients feel comfortable communicating and expressing their concerns to me. I work hard to create this comfort. I'm the one to trust in and confide in. You can rely on me. © 2019 The Duggan Law Firm, P.C.